Ensuring the safety and comfort of your loved ones and yourself is a priority in everyone’s life. When choosing to remodel a bathroom for safety, comfort, or both, it’s key to hire a bathroom remodeler who can make your safety their priority, too. Whether it’s a stylish shower surround or a walk-in tub, hiring professional contractors are key in getting everything checked off your ‘must-have’ list. What Should You Look for in a Bathroom Remodeler? The first thing you should ask about is your potential contractor’s license and proof of insurance to confirm both their aptitude for the job and to protect yourself from any unforeseen accidents to your home or any injuries on the job. Word of mouth from trusted family and friends is the best credential you can get, but if you can’t get that, then checking references, feedback, and ratings online are the next best thing. Take time to research and read the comments to get details, and maybe even a particular name to request for your job. 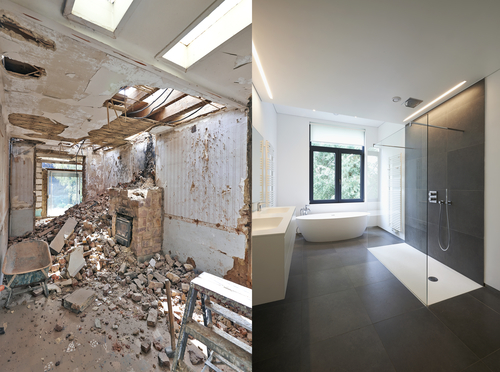 All exceptional professional remodelers will be busy, but they should be able to provide prompt service in a reasonable timeframe from start to completion. This indicates both their organization with scheduling their team and the work order as well as their integrity since a longer timeframe means more money. Bathroom remodelers aren’t just adding a shower or bathtub to a remodel; they’re creating functional and stylish spaces that should be safe and practical with the finished aesthetic you want. Ask to see their portfolio, including before and after shots, various style additions, like backsplashes, and different models of specialties, like walk-in tubs, before you decide. Like any good relationship, communication is key. You want to be sure that from the first phone call to the first day of work, you know the cost, the time frame, and the work and payment schedules. If they’re friendly, helpful, and offer answers to all of the above with a smile, then chances are they will be great workers and reliable communicators during your bathroom remodel process. Comfort Plus Baths is going 10 years strong in St. Peters, Lake St. Louis, Wildwood, and the surrounding Missouri areas as complete bathroom experts, providing affordable, top-of-the-line service and customer care. From assisted living additions in older homes to choosing beautiful new bathroom products, any sized project is welcome. Get the bathroom you've always dreamed of and call (636) 928-4300 to speak with a helpful expert now, and check out their website to see their amazing work.